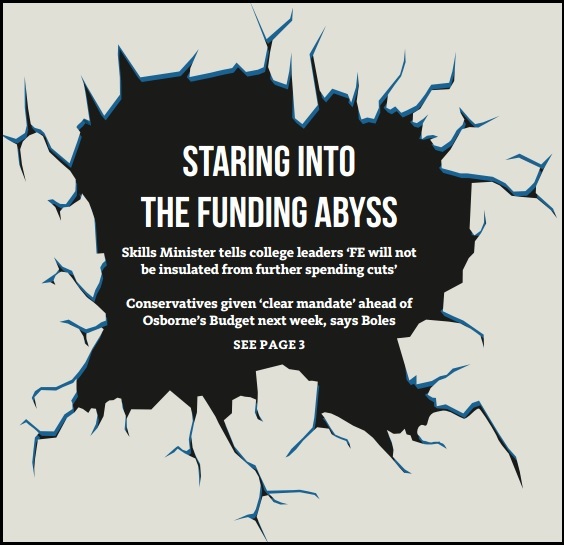 The sector has been left staring into the financial abyss after Skills Minister Nick Boles warned Association of Colleges (AoC) conference delegates that FE would not be “insulated from further cuts” in the spending review. Mr Boles issued the stark warning during his keynote speech to college leaders at the ICC Birmingham on Tuesday (November 17) — just a few days before Chancellor George Osborne is due to announce the results of the Government spending review. He told delegates that the Conservatives had been given a mandate, through winning the General Election in May, to enforce further funding cuts across the public sector, including FE. And looking ahead to the spending review announcement on Wednesday (November 25), he said: “I can’t give you any advanced insight into what is going to happen. “We do not have long to wait and we can talk about it further after the Chancellor has announced it. Mr Boles added: “We won a clear mandate for further spending cuts to bring the budget into surplus by 2019/20. He said colleges would need to become “stronger as institutions, more sustainable, more able to manage the impact of those budgets that shrink and capitalise on the potential of those that are going to increase”. “The first area review which took place in Norfolk and Suffolk has given us a very good model of how the process should work,” he added. “It began sensibly enough with an analysis of that area’s needs — talking to the local economic partnership, to local employers and other groups. Martin Doel, AoC chief executive, told delegates that the Minister had played a “remarkably straight bat” during his speech over the spending review and warned of mismatches between FE policy demands and funding. “You can’t, for instance, ask to promote social integration as part of the Prevent strategy, and remove the funding for speakers of overseas languages — on the same day,” he said. 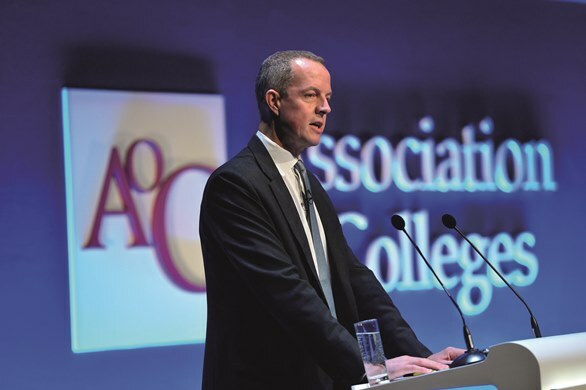 FE Week reporter Alix Robertson asked Association of Colleges 2015 conference delegates for their thoughts on Skills Minister Nick Boles’s keynote speech. With the removal of the SFA and EFA contracts, which means that anybody can deliver apprenticeships, I think one of the things for me is just how they will actually ensure that the quality is maintained in what’s delivered. We don’t want it just to be about reaching a target and a milestone. It’s about making sure that colleges have got the experience and the expertise, are embedded in their community and working with employers. I think in term of quoting numbers: ‘a third of apprenticeships with FE – why do you let them steal your lunch?’ – well, it’ll take time Minister. How much intervention is there with policy on what FE offers, yet there still the question – why is there such a large skills gap? Because FE has never had the freedom to close the skills gap, we’re controlled to the Nth degree on what we’re able to offer, which is very different from universities. I thought it was quite depressing to be honest. Obviously we understand that there isn’t very much money around at the moment, but the reality is that the FE sector has taken the biggest hit for a number of years. We’re very committed to delivering apprenticeship numbers and keeping the provision going, but the reality is that it’s getting harder and harder – there are going to be victims in this and ultimately those are going to be students. There’s a degree of naivety in some of the things that were said. I don’t think there’s anything that he said that we don’t already know. I disagree with the premise that we’re not entrepreneurial, flexible and adaptive. I’m very interested about the funding gaps between higher education and FE and how that might come out and help up to address the deficits that colleges are facing. We’re currently in the area based review for the Sheffield City region, and I think the colleges work well together, we’ll see where that takes us. We know what the challenges are, we know that apprenticeships are the key focus, but employers need to put their hands in their pockets ad pay for the training and commit to giving people jobs. I was interested, I feel some sympathy for him that if he gives money in one area he has to take money away from somewhere else – that seemed a fair enough point to make. So in those circumstances I can’t quite understand why there’s still investment going into UTCs, 16-19 free school and the new institutes of technology. It doesn’t really make sense when the answers to all him problems are in fact in that big conference hall. I asked the minister about an assurance for 16 to 18 year old apprenticeship money. The reason being we’ve used up our entire year’s allocation and we have employers waiting to take on apprentices, but we can’t take on anymore at the moment because we have got no money to do so. It’s a bit of a catch 22 because we all want to employ and recruit more apprentices, but in a financially perilous time it would be imprudent to actually go and do work without the guarantee of the funding. I absolutely agree with Minister Boles about the push on apprenticeships but I’m really disappointed that he had nothing new to say about adult learning and what we need to do about the adults in the workplace who have got poor basic skills. Our Minister said the right things but I was very disappointed sitting in that hall. I felt we were being told off. The question is, why are there different policies for schools and higher education? I don’t have an issue with any of the principal messages, but I do have issues of contradicting policies between the sectors. Schools, more schools, more academies, more UTCs, more competition … things are not stacking up. OFSTED need to be removed from FE so that it can become autonomous and concentrate on educating students and not waste money on being like a social service for young people with no desire or insufficient ability to learn. Colleges waste enormous time and effort producing statistics and introducing new changes to please OFSTED. Money is being wasted on trying to appease OFSTED. Colleges will have to go back to Victorian style “sink or swim” education to balance the books. No money for intervention, learning support or learning coaches to chase after students who are not hungry for education. Subject areas that don’t attract enough students or are not cost effective will have to close down. Equality & diversity officers & similar non-jobs. Can I point out the contradictions in your post please? You say that there will be no money for ‘intervention, learning support or learning coaches to chase after students’ as if these are things you support and then say that colleges should ‘reduce or eliminate’ ‘learning support departments’ and student support and intervention’. I suggest that you cannot take both positions and that your argument re OFSTED is reduced in strength by this. There are no contradictions in my post. Paragraph 1 says money is being wasted trying to please OFSTED by following their latest ever changing ideas. Everyone in FE knows this is happening and very soon we will not be able to afford to waste money on this. Paragraph 2 says that FE colleges will not be able to afford learning support or learning coaches in the future (regardless of whether they are needed or wanted). Hence my reference to Victorian education where you just studied and passed or failed an exam – no support or intervention or statistics. There was no money for anything else! Paragraph 3 suggests what might be cut – basically everything except lecturers. I only have one position. More serious cuts ARE on the way and almost all colleges will not be able to continue running as they do now. FE colleges will not be able to run as OFSTED expect AND stay solvent – it will not be possible and banks will not fund it with massive loans that cannot be repaid. These facts have to be faced. Something has to change and any costs other than classroom/lab/workshop teaching of students will have to be cut. The reality of what is coming is very, very harsh and we cannot stop it. FE colleges may not even be able to afford teacher training courses in the near future as they struggle to avoid bankruptcy. Well for all of you who voted conservative – congratulations – you got what you wanted. I guess there won’t be any part time courses for me to do anymore and I am 30 years too late for an apprenticeship! Did anyone ask Boles how 37% of the vote (just over 20% of the electorate) can be called “a clear mandate” for further spending cuts?